I've ended up not adding the last few stitches in the Take a Stitch Tuesday challenge to my quilt, but I have used them for other projects. Back on track this week, with a stitch that I felt would enhance several areas on my manipulated fabric quilt: the French knot. So simple, so lovely! Love those scattered French knots! I can't wait to see this quilt when it's all done - it's so perfectly ethereal and lovely. 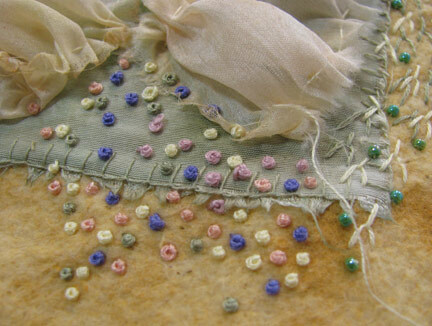 I agree, the French knot is so versatile and can be used in almost any project. You can't really help yourself adding them here and there. Your frenchknots looks like beads.